In EPISODE 16, Heather Thorkelson shares a captivating story about how saying, “No”, (despite public opinion) changed her life. She gives coaching business owners plenty of ideas where to start saying, “No” in life and business. She also provides clear steps on how to get started. Benay: Welcome to another episode of Coach Pep Talk, the podcast for people who run their own coaching businesses. Each week I talk to an expert who shares wisdom that helps us be better coaches and better coaching business owners. This week I’ve got Heather Thorkelson on the line and she’s talking to us all about the power of saying no. This is going to really help you and your coaching business. So see you on the other side. Benay: Coach Pep Talk is proudly brought to you by Life Coach Office. If you are looking for some software to help you manage your coaching business online, you should check out lifecoachoffice.com. What you’ll find there is a platform that will enable you to share materials with your clients, store all over session notes, share journal entries and private document libraries with your clients. You log in, your clients can log in, and you can have everything centralized in one place. If this sounds amazing to you the best thing to do is to give Life Coach Office a try. And you can do that for free for seven-days by going to lifecoachoffice.com and signing up with a free 7-day trial. All you need is an e-mail address. No credit card or anything required. Benay: Today I’m delighted to be talking with Heather Thorkelson who is a business coach, writer, location independent serial entrepreneur. She started a website called The Republic of Freedom and has been running that ever since 2010 which is a really good effort in the day and age of online coach entrepreneurs. She is a certified life coach through CTI and is also a graduate of Seth Godin’s ALTMBA, for those of you who are familiar with that program which is pretty impressive. Heather is going to be talking to us today about the power of saying no and how this little word may be just exactly what you’ve been needing to take into your coaching business to get to the next level. I hope you enjoy the show. Benay: Hello Heather and welcome to the show. Heather T.: Hi! Nice to be here. Benay: Thanks so much for coming on today. I thought we’d do something a little bit different than I normally do and would love to kick off today with you telling us a story of a time in your life when you said no and it actually made a really big impact in your life or business. Heather T.: For sure. So the biggest sort of example I can think of, the most powerful example, let’s say is when I went to university for the first time. I started university when I was 17 which was a little bit younger than the rest of people in Canada at the time for a variety of reasons. I was a little bit younger than everyone else and I had sort of different objectives because I’d gone to a private school abroad and so I had this sort of real thirst for learning. And you know when you start university and you’ve got classes full of 300 people and half of the people are hung over every day and like you don’t have any relationship with the teacher and stuff and you know is kind of a weird scenario where I was like “Hang on a second, what? Like I’m used to like serious learning, you know coming from a private school environment, what’s going on here? I’m not really getting much benefit here; I’m barely understanding like what’s happening in our classes you know it doesn’t seem very structured.” And so I was disappointed and I was thinking, “I’m paying a lot of money for school and I’m not getting what I need.” And also I had a bit of reverse culture shock coming back from living abroad to Canada, where I had to study because I’m a resident, or a citizen of Canada let’s say, at the time. So I stuck it out for two years and I realised that I was just super unhappy. I’m like, “I’m 19 years old. I’m supposed to be picking a major now. It’s been two years of like not really that much value for a shitload of money.” I’m sorry, I don’t know if I’m allowed to swear. ha-ha. Heather T.: So I decided to say no. I was like I’m out of here. And of course my parents would never be okay with me dropping out of university, but I thought this is the time where I need to make some serious decisions about my life. I’m going to go. I’m done. I’m going to come back when I know what I want to do and I’m going to pick an institution that is much better for my needs. and I didn’t want to just switch to another university. I needed out. I needed to like reboot the entire system because I wasn’t happy with my education. I wasn’t happy with that sort of reverse culture shock I referred to in Canada. I needed to just get out and go and figure my life out, I suppose. You know I was a bit discombobulated. So I dropped out of university and just announced to everybody, I’m gone, I’m leaving and moving to Japan. And I got a lot of push back and I just said, no like this is no more to this. And so I did that. I took off and went away for a year and a half to Asia. I came back I went to a smaller school with a better program that I was really interested in and then I continued on from there. And that whole experience of me sort of standing up for myself and saying no to what I was “supposed to do” and the path I was supposed to be following, dramatically changed my life and I actually wrote about this on my website which is in much more detail. I talk a lot about like anxiety and all these things that I went through. So it’s worth having a look at. I think the title of the post is something like ‘Facing Fears and Going Out of Your Depth by Moving to Japan.’ So yeah that was my first like massive ‘NO’ of my life and I think it was one of the best decisions ever. Benay: It seems like your whole business now almost stems from that place of coming from extreme empowerment and I guess dealing with the adversity that came up as a result of you making that choice. Heather T.: Yes, yeah exactly. Like really putting myself to the test because the subtext to that story is that I was really anxious and shy like I was terrified by everything. I had a lot of agoraphobia. I didn’t like being in crowds. Lots of stuff. And I thought how could I throw myself directly into the fire. Well, why don’t I go to Japan where there’s like a bazillion people, and you can never get away from being in crowds, and I don’t speak the language, and I’m going to have to figure out a way to survive. I didn’t have a job I didn’t have a place to live. I had nothing lined up. I didn’t go on one of those programs that people go on, you know I just showed up with my backpack and like five thousand dollars in my pocket and went alright how do I get on here? What do I do now? Heather T.: It was awesome, like it was so freakin terrifying but it was awesome, like it totally forged who I am now as an adult. Benay: I have a feeling that the continuation of that story and some of those fears and things are going to bubble up in the course of the discussion but let’s just take a look at, so when I said you know I’ve got this great audience of people who are coaches, people who are running coaching businesses or they’re about to start a coaching business, and you said I’d love to talk to them about the power of saying no, why do you see this is such an essential tool, specifically for coaches and people who own coaching business? Heather T.: Yeah well I think it’s because it’s one of those things that we totally overlook. So we as coaches are always looking for the yeses. You know we’re looking for the path, we’re looking for the purpose, we’re looking for you know we’re sort of looking in that direction of let’s say positivity. Breaking free of things, you know and into the space of greater self-understanding, greater self-knowledge, greater freedom, etc. but we don’t look at necessarily the things that are the no’s in life. And I think that those are much more powerful and maybe it’s just two sides of the same coin. Maybe what we’re talking about is you know can be the same subject but we’re looking at it in terms of looking for a yes instead of seeing where the no is. And so by that I mean if you are… Let’s say you’re someone who is already running a coaching practice and you’re having a bit of a struggle, right? You’re Looking for answers. You’re looking for the next step. What right now in your sphere do you need to be saying no to. You know? Like there’s always something. If you’re in a rut in any way, or if you’re lacking clarity, there is something in your sphere, there’s something in your business, in your personal life, in your mind, in your psyche That you need to be saying no to. And sometimes it’s a thought process. Sometimes it’s the story you’re telling yourself like I can’t raise my prices, or I don’t want to fire that clients because they might be mad at me, or something like that. You know? Like where are the no’s? Because when you start saying no to the things that aren’t working or aren’t serving you the Yes’s open up so much faster and the clarity comes so much sooner. Benay: So what kind of strategies do you think coaches could start using I guess to start digging out those no’s? Heather T.: I mean there’s a variety of different things and this is something that I work a lot on with my clients and just with the community, you know with writing to my community. Some of the strategies are looking at energy drains and where are you willing to start saying no to energy drains. As business owners, coaches are often people who are juggling a lot of different things. And again we tell ourselves the story we have to justify, well I need to do this, I need to do that and I can’t afford to hire that out to someone. Often times that’s not true. You know often times there is a solution that will work, that will allow you to move towards more of your genius work so one of the strategies I would say is look at all of the different things that you’re doing in your business and which parts of those business, which parts of your day to day business do you need to say no to. Because if it’s not your genius work that’s not where you should be spending your time you know? And whatever the story is like, for example I can’t hire out my social media posting because dit dit di da, whatever, I’m here to tell you I have hired out most of my social media posting it costs me twenty-five dollars an hour to someone that I totally trust which works out to be about fifty dollars a month. Like it is such a tiny little expense that takes so much off my plate. So what in your sphere is not working for you in terms of how you’re running your business and then you can apply that to all the different sections. What about the way that you’re interacting with your clients is off? What do you need to say no to there? Maybe it’s haphazard management of the onboarding process. You know maybe you need to start looking at streamlining things. Or let’s bring it into the personal sphere. Let’s say you’re a coach, you’re a mom, you have a lot of things going on. You’re finding it hard to find the time to really produce content that speaks to your audience. What do you need to say no to there? Do you need to put up boundaries that help keep things under control with your personal you know requirements of life, like the time spent with your family or whatever? And energetically as well, who is in your sphere that’s making you potentially feel like you’re a fraud, or you are you know, who knows, like any of those sort of psychological things. The comparisonitis that comes up and stuff. It’s only on you. The only thing that we really have control over in this world besides death and taxes that we don’t have any control over is your thoughts right. Like we can only control our thoughts. So when you’re having those moments of like comparisonitis or like you know I talked to so-and-so and I always feel a bit bad about what I do. There’s a no one there. There’s always a no in there. You can always decide this isn’t on. I’m not entertaining that anymore. We’re done. and We’re done is I’m done with my own thought. Benay: So what… Some people are probably you know like gulping really hard right now. Like oh my gosh I totally can think of somebody you know that makes me feel like crap every time I talk to them and you just suggested that I just say no, I’m done. These fears are bubbling to the surface. What advice would you like to give to those people in that situation right now? Heather T.: Yeah for sure. Well it’s totally person dependent right. You know like as coaches; we teach people to manage things in the best way for them. So it’s all very individual. But when I see that it has to be you know you have to decide on your no’s, it doesn’t necessarily mean that you’re not going to be that person’s friend anymore, but it is a decision to not take on that energy anymore. Whether you tell them or not. So like let’s say just for example, someone who makes you feel like a fraud every time you talk to them. You can either not talk to them as much or you can talk to them and every time they say something that just doesn’t fly, you deflect it. Like I remember once an exercise that I did with the client, she decided what she needed was a shield, like a metaphysical shield you know? And she was like every time someone said something like to me that makes me start to feel bad, I’m going to pretend that I have this golden shield in front of me and it just bings off into the universe. It’s not mine. I’m not going to take it on. So she never actually told the person who was making her feel bad, Hey like enough of that. She just created this tool that helped her cope and it actually made her incredibly strong because she was free of that judgment. She was free of being brought down by that. So that’s like one example right? Benay: Before you move onto the next example I just want to say can we all use that shield of hers? It just sounds amazing. ha-ha. Heather T.: Oh my god, please do, please do. After having watched Wonder Woman last week, I’m like everybody needs a shield. Benay: I’m wearing my Wonder Woman t-shirt right now! Benay: Next strategy or two, we’ve got the shield concept that was one example? Heather T.: Yeah so the other example would be, I mean there are so many examples but another example would be to actually stand up for yourself. You know like especially women we’re really really really bad at saying, you know I don’t really agree with you or whatever. You know? We’re bad at standing up for ourselves and so I would say that the other tool is learning how to stand in your confidence about what you’re doing. You know like oftentimes the people that we’re getting the judgment from are feeling the comparisonitis around. They are so far removed from what it is that we’re doing. I mean just being an online entrepreneur, sometimes we think oh but everyone’s an online entrepreneur. That’s just our little group of people on the internet. It feels like there’s a lot of us but the average person, like your mom and your aunt and your uncle and whatever, they work in the normal working world, right? So they don’t understand the types of work that we do. They don’t. A lot of people don’t understand coaching. You know my mom doesn’t understand coaching, she doesn’t understand why people pay me. And so she’s like, why don’t they just go to a therapist and I’m like well… You know we have to think of frame of reference right? So people’s frame of reference is often quite different than ours. And so there’s real power in standing in your confidence and owning what you do and actually having conversations with those people and saying like, I know that you don’t understand what I do, But the reality is that the work that I do you can have a huge impact on people’s lives and I’m really proud of it. You know like that kind of language, learning the language of your own confidence, is super powerful. And that’s another way of saying no. No I’m not going to listen to this anymore. I’m not going to entertain your judgments of me because I believe in me and I know what I do is amazing. And I’m going to bring you around to my side whether you like it or not Mom, or whoever you know. Benay: Yeah. How would you recommend somebody go about exploring their language of confidence? Is it a journaling exercise or what do you do? Heather T.: Yeah. Well so many things but writing is definitely a really good one. Like writing from that place of confidence you know? Saying okay I’m going to be fully in body you know, I’m going to a sit for five minutes and get into this most confident space that I can and then when I start writing out why I believe in me and why I believe in the work that I do. Or whatever it is that you need the confidence around. That’s one really great way. And then say it out loud. Call up someone who really believes in you and talk to them about it you know. Or do it verbally. Some people are very verbal, they’re not into the writing thing, or the words don’t come as easily. I find that one of the best things I can do when I’m struggling with something or I need to get clear on a concept is call up one of my best friends who is also an online entrepreneur. And I’m like okay Lynne, I got to talk through this with you. And it’s amazing like how the words start to flow, and how the concepts start to flow, and how my courage really starts to come forward. It’s a very powerful exercise. so Whatever works for you whether it’s writing, journaling, or having a conversation with someone who is already fully on your side, I think those are incredibly powerful tools. Benay: Anything else? Any other tools you’d like to share? Heather T.: I am a big fan of getting away from the internet. I think that being out, I mean I live in Sweden right, I live in rural Sweden on the water and there’s lots of forests and stuff nearby and I love the forests. I love the outdoors. So I love to just go out, leave my phone at home and like go to the forest and pick berries and be out in nature, and let my mind be free of the distractions of modern life. Because I think that’s also a time when all the things that we’re sort of pushing to the sidelines, because we’re busy with life, and with emails that are coming in, and family and whatever that’s when those other things start to kind of flood back into the center of your mind. So giving yourself that mental space when you’re feeling kind of a lot of pressure from here and there and you’re like lacking in clarity just get out, go. Like. Alone. You know go zone out, go sit in a boat somewhere, or whatever and give yourself the time to process. I mean can tell I go to the yoga mat and do that. Great! But Take it a step further. Like get away from everything. That would be another big one. At least that’s something that works for me extremely well. Benay: Yeah I’ve used that one before too. Definitely I like to go through phases and I just unsubscribe to absolutely everything. I only got a phone like six months ago. Heather T.: Me too actually. I never talk on the phone. Benay: It’s really cool, like I don’t have any apps or anything, and I just find it’s all just a bit, I just don’t care. I don’t want to use my phone when I’m out. I don’t want to be one of those people standing in line you know, at some place and texting or… You know I want to like appreciate what’s around me. Heather T.: Do you know the thing is Benay, like if you’re standing in the line full of people who are frustrated, most of whom have their phones, right? And you don’t have your phone and you’re just taking it in think of the power that you have in that moment to have a good influence on someone’s day. Because you’re not absorbed in technology, your present right? So everyone else is super frustrated and you have an opportunity to defuse the situation by turning to your neighbor and saying, well this isn’t great fun is it? Hanging out in this line. I’d much rather be eating a donut. Or Oh I love or top, your top is gorgeous. You know like compliment someone, or call out the whole crappy situation as it is, so everyone can go yeah man and then it just kind of like connects us as humans and like takes the edge off you know. Like we’re missing that so much. There’s some real amazing… I don’t know, you know as you say, just get out of this sort of modern technology, being constantly consumed by everything, and being present. So I think that going out in nature is a catalyst to that. But you’re right we can be present in other ways on a daily basis for sure. Benay: Yeah yeah that’s a big one I think. Just making yourself go away from technology. Okay. So for the coaches who were listening, it sounds like we’ve kind of come up with two steps, being able to say no to things is really important, but when you’re actually trying to identify- okay where do I start what do I need to even say no to in my life? There’s this first sort of hunting process, where you’re looking out for energy drains or things that are taking a lot of time, but that aren’t your genius work. There’s family or you’re comparing yourself to people. That’s kind of that first step. And then once you identify that you can deflect it with your shield or stand up for yourself by saying in your confidence and getting away from technology. Anything else you want to add into that mix are there any more steps to helping people be able to say no? Heather T.: I think it’s really important to point out that people who don’t say no, are staying there out of a place of fear. Usually. I’m afraid that I will upset someone if I say no. Or I’m afraid that clients won’t hire me anymore If I say no to this, or if I put up this boundary. Even things like niching down to a specific target group you know people are like, but if I go so specific then I’m cutting out all these…I’m saying no to all these other people who might need my help. Benay: I hear that all the time actually. 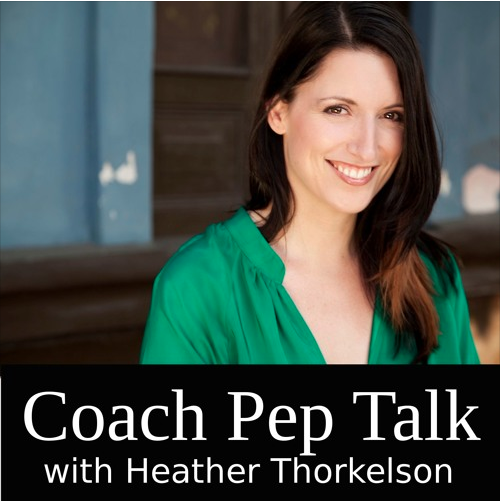 Heather T.: Exactly it’s I think it’s actually the biggest problem of coaches, is they’re like but I can help everybody. Yes, you can help everybody, but you have to start somewhere and you know, being able to say no to that. Getting rid of that fear and going okay, it’s totally okay for me to say no to everybody and go down to group X, because that is my starting point. That is going to actually give me more empowerment as a coach in the long run because I’m going to establish myself with a specific group of people who definitely need me. And once I’ve established myself there and I’m doing well and I’m making money and I’m getting referrals, I can branch out into other areas. So the point being that if you’re listening to this and you’re like, oh but the no’s, I don’t want to say no. Look well the fear is, like look within yourself, in your own psychology. Like what is it that you’re afraid of? Because That fear is probably just a false expectation appearing real. Right? I mean it’s not real at all. Most of fear is not real. Fear actually was an evolutionary imperative to keep us alive back in like cavemen days right. We were afraid of like lions eating us, or being cast out of our community because you know then you couldn’t survive on your own when you were a caveman. But these days this stuff it’s not valid anymore. I mean, you’re going to be fine, no matter what you do. But you need to be strategic and your fear of saying no to what’s not serving you is keeping you from being strategic. It’s keeping you from being successful. So there’s that piece as well and it’s really worth thinking through and talking through with an objective secondary party. Benay: You know when I came into this episode and I was thinking about well I wonder you know where this conversation is going to go. I was thinking it might be like one big decision point or a crossroads where people, coaches might be and might need to say no. But what it sounded like to me, through the course of this discussion is actually there are many things that probably most coach business owners need to say no to right now. Benay: Is that an accurate interpretation of what I’m hearing? Heather T.: Yes, yes absolutely absolutely. Many things I need to say no to right now, but also, and this is something that might sound a little bit strange, but you need to be saying no all the time. Like your whole journey is a process of saying no to the things that don’t serve you. And in the past when I’ve been on other podcasts I’ve often been asked the question, you know what do you think it is that contributes the most your success? and I can tell you without a shadow of a doubt and this started at ground zero when I dropped out of university and moved to Japan. I am hyper hyper hyper mega clear on what I don’t want. Like so clear. Because most of the time we don’t know what we actually want. We don’t you know; we’re trying to figure out our passion. We kind of go three steps in this direction and two steps back and four steps in that direction and one step back. And you know it’s hard to find the path. The path is very long and varied. But the one constant for me is that I know exactly what I don’t want. So it’s very easy for me to say no. I know who I don’t want to work with. I know how I don’t want my days to be. I know without a shadow of a doubt, I do not want to run a Facebook community, so I will never do that, even though even if every online guru says that’s the thing to do these days you know like I’m very clear on that, so it’s easy for me to come up with my no’s. So yeah you’re right it should be… There are things right now that many people could look at where they need to say no to, but also continue on that. Every time an opportunity comes up every time a situation comes up every time… You know whatever it may be. Something’s not working in your business. A Clients not working out. Your systems are sort of not working for you they’re working against you. Figure out what’s going on here. What do you not want anymore? That’s going to be more important than what you do want, which is constantly changing. Benay: Ok, so This is interesting. You know being in the coach’s space and we’re talking to a whole bunch of coaches here you know and a lot of them probably you know they might be really into vision boards and being really clear on what you do what how do you reconcile visions statements and all that with this real clarity on what you don’t want? Heather T.: Well that’s actually a really awesome idea that I had never thought about making it anti- vision board. Seriously? like How cool is that? Put together a vision board of everything that you want to run screaming from. And then you stick that up and when you’re making decisions in your business look at your anti- vision board and go oh no. Nope not gonna do that. Benay: Really interesting. I wonder what, you know, because I’m just thinking of my coach training, back you know when you’re trained in NLP, and they say you know don’t think of a blue tree because the unconscious mind takes the don’t out and you only hear the thing after, you have to think of a blue tree. So I wonder what would happen to your brain if you did do that? I don’t know. Benay: Do you have a vision statement also? Heather T.: I don’t. I don’t. I mean in fairness like I’m going through a sort of a big transition phase in my business right now. So the vision is changing to be sure. But what guided me in the beginning was always the concept of freedom, right? I mean I’ve been doing this since 2010, Republic of Freedom has been around for a really long time now, in Internet years let’s say. So it used to be that my vision was just, if it’s going to take away from my peace of mind, from my day to day freedom of time and my mental freedom, it’s not on. Like it was just really simple you know. and You know it wasn’t always simple to make the decisions but when I defaulted to that, that was sort of what my vision was and I wanted to encourage other people to follow in that line. Like what is it, you know Republic of Freedom is about helping people through coaching, develop the freedom that is meaningful for them. Right? So for me it’s the freedom to move around, to live abroad, to travel, whatever. you Know. To wake up in the morning and decide what I’m going to do that day or how my day is going to look without Other people deciding for me. This is really important for me. But for someone else, freedom might look like simply the ability to not have to go into an office every day. May be the freedom I would like to work from home but I can pick my kids up from school you know like it can be whatever it is. So I wanted to keep the concept as loose as possible so that it was applicable to as many people as possible. And not just people who have these luxuries and the privilege of deciding whether to work from home, you know? Like I want it to be applicable to all human beings. And so you know that’s still true. But the vision for my business moving forward is shifting a little bit just in terms of you know how I am approaching things and I might, now that we’ve been talking about it, I might have to make an anti-vision board. Benay: An anti-vision board ha-ha. Heather T.: Actually it sounds hilarious. Benay: When you have some results of that I’d love to have you back on and let’s talk about it. Heather T.: For sure, for sure, I’ll put it on Instagram. Benay: That sounds awesome. So I’m just curious because you actually have an interesting lifestyle choice, very similar to what I’ve set in my business, too. How many hours do you actually work in your business a week on average? Heather T.: Well I have two businesses actually. So yeah, before the second business started to really ramp up, I was working about five to six hours a day on my Republic of Freedom stuff. Right now my other business is completely exploding and so I’m really spending a lot of time over there. I’m sort of taking a step back during the summer months to focus on that growth, and planning, like I keep referring to the shift, I’m planning for the longer term of Republic of Freedom, which is going to shift and change and grow in September in its own direction. So right now because of my other business, I’m working like crazy amounts, I’m working like eight to 10 hours a day. And it’s divided between both. But with more focus on the other business. Benay: And can we… Is this a surprise or can you share what the other business is? Heather T.: Oh, it’s not a surprise at all. I’m happy to share. It’s a polar expedition company. Heather T.: Yeah. So we help people, we book people and we charter ships for the Arctic, to take people up to the Arctic to see polar bears. And we book people to go on tourist expedition trips to Antarctica as well. Benay: Wow I’m going. Okay that sounds great. Heather T.: Yeah. Its super fun! Benay: Yeah, maybe we can hook up when I in Sweden next. Heather T.: For sure, for sure! Benay: Okay. So if you were going to give the coaches listening to the show just one action item that you’d love for them to do today as a result of listening to this show what would it be? Heather T.: One action item, I think probably the most powerful thing is to just sit down and literally write out on a piece of paper, what you’re struggling with right now. Whatever that is, whether it’s in your business, with your life, in your own mind, in your family and your personal relationships, whatever. Just write down like here are my three things that are sort of weighing heavily on me an assign one No to each of them. Benay: Awesome! I love how succinct that is. I’m gonna do that after I get off the phone with you actually. Benay: Okay. If people are listening to the show want to find out more about you, and maybe both of your business ideas, where can they go? Heather T.: They can go to Republicoffreedom.com. You can also search Republic of Freedom on Facebook, because I have a Facebook page, but really the website is sort of where it’s at. I suppose I have some good resources that people can download. I’ve got some videos as you had mentioned to me earlier, Benay, that you watched. Some videos that are meant to sort of inspire and motivate. I also hang out a lot on Instagram, so if you want a nice mix of like my life in Sweden, and travel, and my experiences in the polar regions, which I spend a bit of time in. On Instagram, I’m ‘repoffreedom’ because Republic of Freedom was too long, so it’s repoffreedom on Instagram. Benay: ok, and I will put all the links to those in the show notes. Well, Heather, thank you so much for taking time out to talk to us today. It’s been a real pleasure to get to know a little bit more about you and your two businesses. Heather T.: Yeah thank you so much for having me Benay. It’s been a lot of fun. I appreciate it. Benay: And thanks listeners. Please be sure to go and like the show on iTunes, that will really help us out. All right everyone, have a great day and happy coaching. If you need someone to interview for your podcast, I would love to talk. Please check out my YouTube channel through my website and hear other interviews.